This interview excerpt follows from On the Curatorial in India (Part 1), in which leading subcontinental art historian and critic Geeta Kapur candidly discussed the emergence of India's contemporary art scene. Here, in conversation with Natasha Ginwala, she discusses notions of nationhood and identity politics in the context of curation. NG: I would like to briefly re-visit your landmark exhibition Place for People (1981). Did your personal rapport with the artists in the exhibition equip you in some special way to critically analyse their embedded intentionalities and practice? GK: Place for People (Delhi, Bombay, 1981) was a self-generated project of six artists and a critic. We did not anyway use the term curator at that stage and I functioned very simply as a member of a group or collective. This was therefore not my exhibition: though this misunderstanding continues — an amusing anachronism based perhaps on those later battles where I, and others, would actively claim the nomenclature and rights of a curator. Place for People began with the theorising of narrativity. The works developed simultaneously and even as a consequence of the discourse on contemporary narration, as a still-valid mode within an honourable and inclusive art-historical frame of narrative painting. The first round of discussions took place among Bombay and Baroda artists, then came to be staged in Baroda with its key artists in dialogue with the vociferous English artist and critic Timothy Hyman, who was then lecturing at the Faculty. We were all inspired by Bhupen (Khakhar); he had set the agenda to think differently, audaciously, about what it meant to belong to a place, to respond to vernacular cultures, and narrativise the self within the everyday. At the same time, artist-pedagogue Gulam (Sheikh) provided the art-historical dimension to pictorial narratives, ranging from Siennese paintings to Persian miniatures. This greatly enhanced our collective learning. NG: The exhibition has remained a vital marker and been curatorially re-visited through recent exhibitions like Horn Please: The Narrative in Contemporary Indian Art (Bern) as well as New Narratives: Contemporary Art of India (Chicago). How would you (re)position ‘narrativity’ within current artistic paradigms? GK: Over time my interests have expanded and diverted, I have been engaged, besides painting, with different art languages and with media-based practices. This is evident from my subsequent writing and, specifically to the issues discussed here, my curatorial projects: Dispossession, a small focused show of women artists at the 1st Johannesburg Biennale in 1995; a very ambitious project, Bombay/Mumbai (in collaboration with Ashish Rajadhyaksha) for the multi-part exhibition, Century City: Art and Culture in the Modern Metropolis, at Tate Modern, London, 2001; subTerrain: artworks in the cityfold, as part of a multi-arts, Body.City project at the House of World Cultures, Berlin, 2003; and diVerge (with Sambrani) for Chemould Gallery in the NGMA, Mumbai. I shall only emphasise that the very selection and installation of these later exhibitions demonstrates my altered focus; more particularly, my interest in staging an artwork in a (theatric) encounter, rendering its presence as a phenomenological experience. What remains from the days of Place for People is an engagement with history and subjectivity, and the politics of place, whether it is the nation or city or imagined and contested site. However, Place for People did change the direction of Indian art by producing both straightforward and contrary consequences. Narrativity was taken up, perhaps too literally, by younger artists in Baroda; it was then contested in Baroda itself by the Kerala Radicals, on the charge of being in tune with postmodern pastiche. Even as they chose more direct, more topical forms of intervention, the Radicals kept up the narrative urge, triggering an interesting debate among Bombay and Baroda artists. As for the longer-term effect, I will refer to two (among many other) artists who chart narrativity from the 1990s — Atul Dodiya and Jitish Kallat. With exceeding skill, Atul excavates and enriches the material layerings of the narrative form — as in his brilliantly composed (first) set of roller-shutter painting/installations in 2000. Jitish continues to extend the social cause of representation through a heavily camouflaged iconography negotiating the politics of a mega-metropolis like Mumbai. Exhibitions like Horn Please and New Narratives have engaged with the ramifications of the narrative with the intent to create a distinct enclave for Indian contemporary art. NG: Could you tell us about the exhibition you curated — 100 Years: From the NGMA Collection? GK: This was my third major exhibition; the first was a large exhibition in 1977 that the Lalit Kala Akademi ‘commissioned’ me to curate in their magnificent Galleries—I titled it Pictorial Space. The second was an even larger exhibition, Contemporary Indian Art, presented during the Festival of India and mounted in London’s Royal Academy of Arts galleries in 1982. The third project at the National Gallery of Modern Art came about in 1994 when I was invited as an honorary member of the NGMA advisory committee of to mount an exhibition from their holdings. I sifted through the Collection by physically looking at hundreds of works. My selection criteria was based on the idea of laying out an itinerary across 100 years — a walking/looking itinerary through modern Indian art. No works were borrowed from other collections, which means there was a constraint on choice; an expressly NGMA exhibition, it was what is called in standard museum language, a re-hang of the Collection. The passage was mapped, predictably perhaps, from Ravi Varma until the most contemporary work available at the time. But the itinerary had its twists and turns; it was not laid out chronologically nor strictly by schools and styles. The spectator walked through a broadly delineated period and encountered unconventional and hitherto untested juxtapositions. To give one example, I placed Ravi Varma and Amrita Sher-Gil face to face in one room to suggest the ‘studio’ academicism in each, and then in another room, I installed Sher-Gil paintings beside Jamini Roy’s for an opposite ‘thesis’ — because they were contemporaries experimenting with a diverse range of Indian art-historical antecedents and arriving at certain abbreviations that placed them in a keen, tangential relationship to modernist language. I was, in other words, testing and revising our familiar art history — on the walls, in the act of traversal, through the act of looking. There is the art history of the text book, based on carefully sourced influences and the evidence of styles; there is another that reads signs and meanings in conjunctural ways. The latter is experienced phenomenologically, on museum walls and related spaces. It may have been reckless to propose a revisionist art history on the walls of the National Gallery, but I was doing the same in my essays that were to appear a little later in my book, When was Modernism (2000). I could of course have been legitimately criticised, but that the exhibition would create such offence within the art establishment, such controversy in the media (mostly newspapers) was scarcely anticipated. The very State found it necessary to intervene. Some works were ordered to be installed overnight within my exhibition; they were removed when I resisted by quoting the curatorial mandate of autonomy: you can tear the curator to pieces but you don’t alter the installed exhibition on grounds of the criteria deployed for exclusion/inclusion. This was an early battle: for the very naming of a curator and, further, for curatorial independence, for her/his professional responsibilities and privileges. All this took some years to mature. By the time I did another show in the precincts of the National Gallery in Mumbai — co-curated with Chaitanya Sambrani for the 40-year celebration of Gallery Chemould — the decks had been cleared. I suspect however that even now there can be no guarantee with State institutions, and though private galleries are willing, there are glaring gaps in their understanding of what constitutes curating in the first place. NG: The past few years have witnessed a large number of ‘blockbuster’ exhibitions showcasing Indian contemporary art on the international art circuit. Could you share your thoughts on the curatorial frameworks employed when 'Indian' contemporary art is exhibited abroad? GK: The way a curator understands and contextualises the ‘contemporary’, and ‘India’ is of the first significance. Recent ‘blockbuster’ exhibitions have tended to be seduced by the rhetoric of globalisation, choosing this one focus rather than other critical aspects of exhibition-making. Globalisation translates into spectacularised scale and a kind of packaging that makes the art object more object-like, more commodified. Besides, the national format has produced so many permutation-combinations of exhibition-making that it has now become difficult to produce something different in the name of India. Speaking for myself: until recently I thought I could create fresh meanings through re/configuring a site, a theme, a problematic. Now I am not so sure… maybe I am, or we are, experiencing the limitations (please note: I am not saying redundancy) of the national format itself, and a sense of exhaustion. The ‘big’ exhibition needs to be re-imagined so as to function as a constellatory site for new questions. Even as diasporic dilemmas widen the political base of global issues tackled by art, they tend to produce, within the transnational space, a straitened convergence. If the form of address of an artwork is coextensive with the site of production, even confrontational work addressed to the first world or, shall we say, to the centripetal heart of capitalism, marginalises region and nation, societies and living communities, into the category of geopolitical context ― no more. These imponderables of identity and address require the interlocutors to assume a multiplicity of agential roles so as to move back and forth between a speculative transculturalism and a declared partisanship. It is still necessary to ask how art situates itself in the highly differentiated national economies/political societies that bear the name of countries; and how, from those sites, it reckons with divergent forces at work within globalisation. More pointedly, what are the countercultural tendencies generated in the contested sites of the nation-state itself? With what strategies is a neoliberal, anti-poor developmental agenda and/or a (covertly) authoritarian state opposed? What political positions are upheld by the recognisable protagonists of radical change? Further, how, in the broad attempt to build and sustain democratic structures of governance, institutions for a functioning civil society and a post-bourgeois public sphere, does the cultural vanguard in its more anarchist gestures come to be positioned? And, indeed, what strategies are available to these societies to oppose the treacherous rule of capital and its US-driven agenda executed through monstrous wars and consumerist dystopias? Billed under a country banner, the aura of national affiliation still survives. A critic-curator from India will have to go beyond sentiment to claim that a selection of artists from a particular country or context, properly conceptualised under a theme and a problematic, can, in the consequent exposition, address ‘universal’ issues of global contemporaneity. This, incidentally, is assumed to have been the case with selections of European or American artists throughout the twentieth century. A substantial partisanship from the southern end should add both to art-historical knowledge and to political agendas that go beyond a mere counterbalancing polemic against the transnational and the global. NG: Could you provide an instance of curatorial involvement wherein you have negotiated this transnational terrain and how the polyvocality of Indian modernity may be addressed within such a context? At the turn of the twenty-first century, I was asked by the Tate Modern, London, to conceptualise and curate an exposition referring to the visual culture of an Indian city, for what was to become its inaugural, multipart exhibition, Century City: Art and Culture in Modern Metropolis (2001).2 The dynamic of art and visual culture at specific points in the twentieth century was sought to be brought into focus by nine city-sections—Paris, Vienna, Moscow, Rio de Janeiro, Lagos, Tokyo, New York, Bombay and London. This involved not simply a choice of a decade or of a political moment, but of a historical conjuncture in the twentieth century. Working with the film theorist Ashish Rajadhyaksha as co-curator, I selected Bombay in the 1990s as a signature twentieth-century metropolis. We focused on its peculiar dynamic, pitching it not simply as a local cultural variation on the theme of the modern, but a demonstration of the co-production of modernities at different sites, national and metropolitan. We looked for the consequences of these processes as they force their way into contemporary history: from policy-driven economic choices to forms (and distortions) in the democratic functioning of urban space, to the peculiar characteristics of its multiregional, multireligious citizenry and the public sphere it evolves (and too often fails to sustain before neofascist vandals). Indeed, far from being merely a case study of difference, we proposed that historicisation of this kind constitutes the very definition of the twentieth century, from which neither the cultural nor the political imaginary of the white-western, first-world citizen can escape. As for the artworks in ‘Bombay/Mumbai’, some were specially produced, others selected for the exhibition with the hope of achieving a spectatorial extrapolation on the peculiar form of the Indian metropolis. What guided the curatorial approach and the exhibition itinerary was elicited from the spatialisation of the project in the famous Turbine Hall of the Tate Modern where London and Bombay of the 1990s were mounted face to face ― becoming, as it were, the most recent, thus precipitate ‘claimants’ to the status of Century City. NG: Are there any other recent exhibitions with curatorial structures exploring ‘national’ perspectives that you would choose to highlight? I would like to refer to a recent, major exhibition of Indian art that has gone by unremarked in the Indian and international media. Dedicatedly researched, designed and displayed, and extensively annotated with a magnificent catalogue, the exhibition was curated by Juan Guardiola for Casa Asia and IVAM, Institut Valencià d’Art Modern, Spain (December 2008–February 2009).3 Called, simply and correctly, India Moderna (spanning the nineteenth and twentieth centuries with documents and artworks from the eighteenth and twenty-first centuries bracketing the period of the modern), the first part of the exhibition was expectedly configured by a superb selection of (colonial) photographic representations. Then, moving across to the struggles for independence and the new republic, it displayed an unexpected, indeed unprecedented range of materials, including photography and artworks, films, texts and installations. Fragments were converted into documentary evidence by subtle imbrication but that these adhered to a clearcut timeline. This chronological insistence offered the viewer a strong narrative of a determinate modernity; and it offered a walk-through in the symbolic domain of the nation. 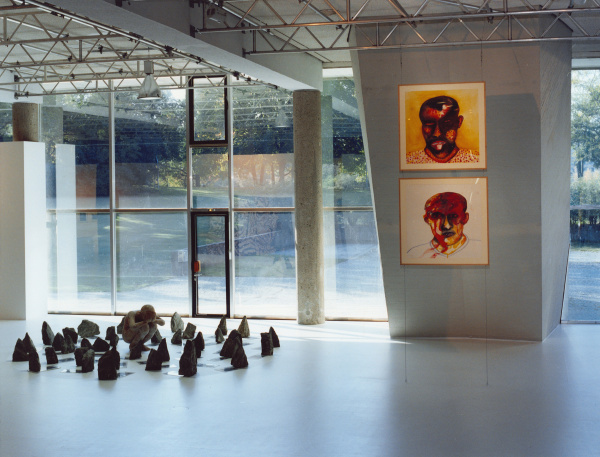 Laid out within the compound trope of the national-modern, the exposition made simultaneous use of iconography and morphology, representation and form, anthropology and art history, indigenist and statist ideologies of art―whereby it circumvented the problem of overdetermination and gained a degree of reflexivity. In addition, and this is crucial, India Moderna offered a curatorial itinerary of signs that were put out on a plane that allowed slippages into forms of eccentricity. Guardiola, a modest, brilliant curator, configured this itinerary to play out an elusive discourse of ‘sovereignty’ within a maze of detours. On a much smaller scale, what also comes to mind with the ‘national’ barely concealed in the thematic is the following exhibition: the extraordinary selection of art from Pakistan in the Poddar Collection, brilliantly curated by Rashid Rana under the title, Resemble Reassemble (2010) for the Devi Art Foundation. The exhibition was conceived and presented in such a way that ‘Pakistan’ would appear in sharp focus, then disappear, allowing the articulated concerns of individual artists to speak in a reflexively intoned voice-over.